Fantastic colonial property very well located in the old town of Quito. It has a great cozy atmosphere in the middle of a cobble-stone street. It is administered and attended by the owner himself. Services included in the price: Wi-fi (free internet), well equipped kitchen, reception 24 hours, restaurant, terrace, BBQ and garage. The price also includes taxes. You do not have to worry because we provide soap and towels. Other services not included in the price are: Laundry area, taxi service 24hours and guided tours. Extremely competitive prices that you will not find anywhere else with such great quality. 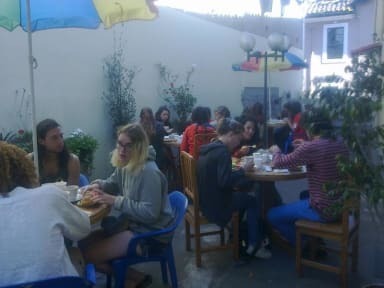 In other words: The quality-price ratio is unbeatable compared to any other hostel/hotel in Quito. The property is 50 meters close to the 'Cumando Bus Station' which takes you anywhere within the city (Buses cost only 25 cents). 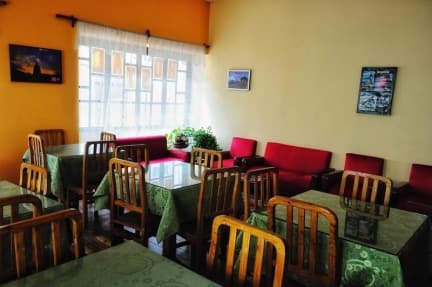 It is also only two blocks far from 'La Ronda' which is a beautiful picturesque street full of restaurants, pubs with live music and typical ecuadorian places. You can see 'El Panecillo' (symbolic statue of the city) right from the terrace of the property. Have spent five nights there and felt very safe and comfortable. The offered breakfast for 3$ is nice and includes coffee/tea, a fresh juice, eggs, fruits and bread with jelly. When arriving, it is easier to find your way from the Trole Station Santo Domingo. For tourist information/booking tours one better goes to community Hostal, from where also a free walking Tour is offered daily at 10am. Super nette Eigentümer und leckeres Frühstück. Sehr nahe Lage zur Ronda, was am Wochenende sehr/ extrem laut ist. Tolle Aussicht vom Dach/ Terrasse. Nicht weit vom Zentrum der Altstadt entfernt. Leider ist das Bad sehr renovierungsbedürftig und in allem nicht sehr sauber.